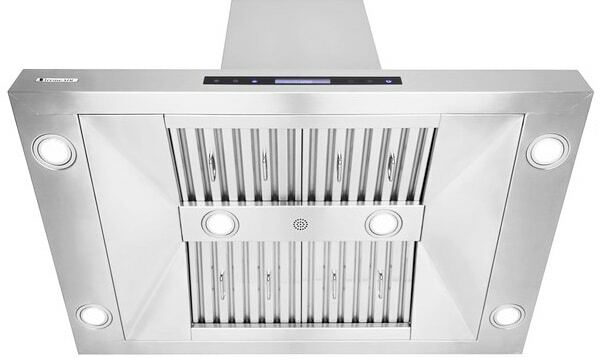 Are you looking for a new range hood for your beautiful cooking island? It's easy to get overwhelmed by the sheer amount of range hoods available, especially since they all look somewhat similar. 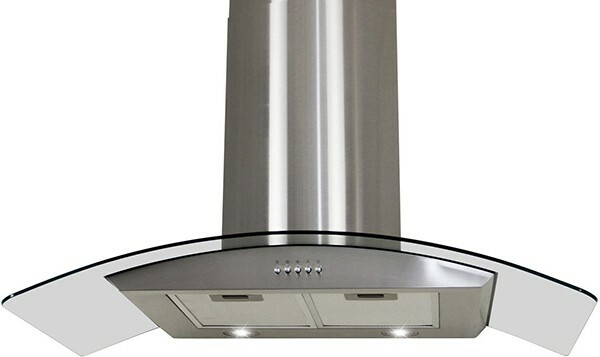 Since modern range hoods are an important and very visible part of your kitchen, the decision to buy a specific range hood is a hard. 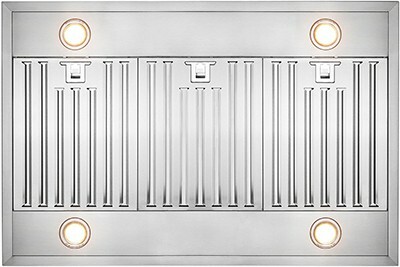 That's why we at Rangehoodguide.com have put the five best island range hoods of 2018 in one list. The first thing about the GV-RH0219 that caught our eyes are the unique baffle filters. 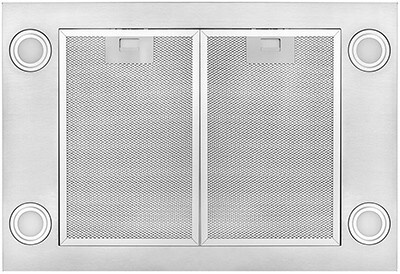 Where normal baffle filters have rectangular slits to pass air through, this range hood is equipped with something Golden Vantage calls ‘maximum efficiency baffle filters,’ which have circular holes in them to provide a greater surface area. This supposedly helps with extracting grease from the air. 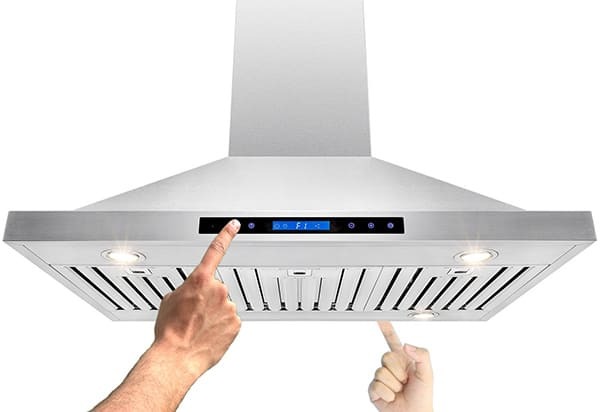 We haven’t had enough experience with this range hood to fully check this, so at the least you will end up with a great looking range hood. 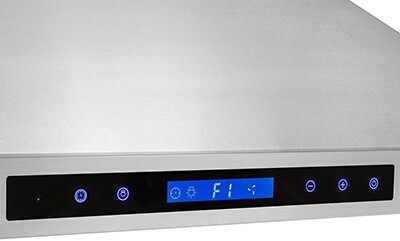 Even though this range hood has 4 LED lights (blue tone), they seem to be a bit dim. We wouldn’t recommend these LEDs to be your primary kitchen light source. The touch screen on the controls can be a bit flimsy, as sometimes it needs a hard press for the command to be registered, and sometimes a light touch is sufficient. 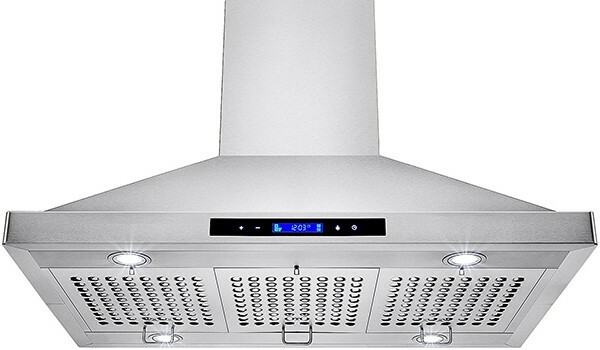 Lastly, this range hood isn’t the sturdiest of range hoods. Then again, do range hoods need to be heavy and thick plated? 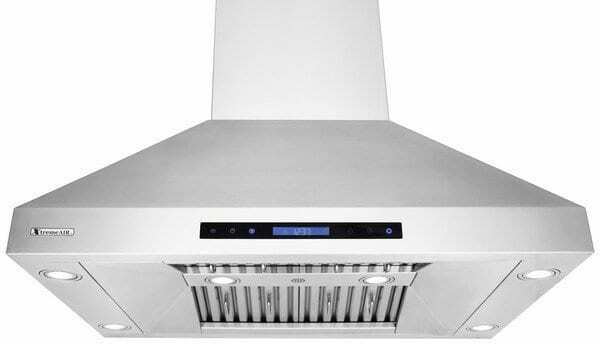 The first things which stands out is that the AKDY AK-RH0217 is equipped with baffle filters. Compared with the alternative, aluminum mesh filters, they do a better job in trapping grease and are easier to clean. Combined with the modern stainless steel finish, the AKDY AK-RH0217 has an almost commercial-grade look to it. Another nice feature of the AK-RH0217 are the controls. 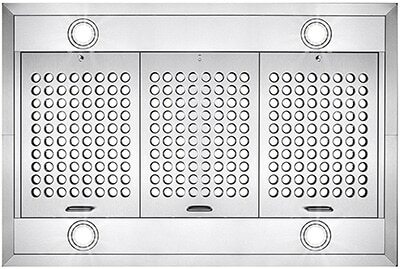 There’s a touch panel located on two sides of the range hood, which comes in handy as it’s an island mount range hood. If that’s not enough, you could always use the remote control. 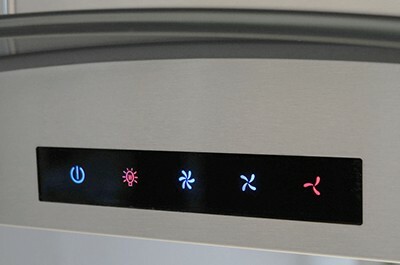 Another nice touch is the automatic activation, which turns on the range hood when the stove gives off too much heat. 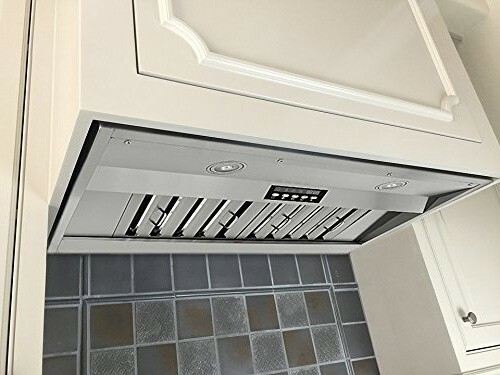 Similar to many of its brothers and sisters, this range hood will come with a very limited instruction manual, which means that you might have to get someone to help you with the installation. 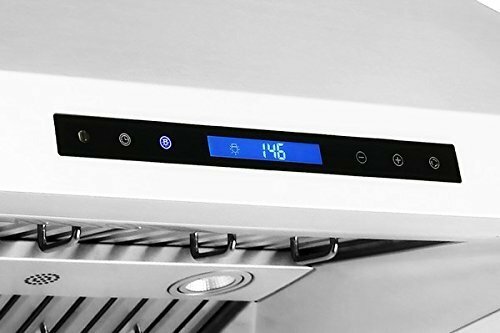 Before installing your range hood, be sure to check it for dents or other damaged parts, as some people have complained about receiving damaged goods, which is most likely a result of mass production (hence, the competitive price). What immediately jumps out when looking at this island range hood is the stylish glass canopy. The glass transforms the range hood into an eye-catcher, which makes for a great focal point in your kitchen. However, incorporating glass into a range hood meant that they had to make room for it. So instead of the usual three baffle filters, this island range hood has two. 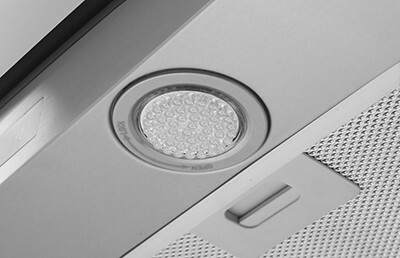 We’re glad the manufacturer chose to produce the range hood with LED lighting, rather than halogen, fluorescent or incandescent lights. The LEDs are relatively very bright and give off a blue tone. This gives off a very modern feel and complement the stainless steel and tempered glass exterior. A missed opportunity is to incorporate a dimmer so that the brightness of the LEDs can be controlled. Sadly, the installation manual is very limited. 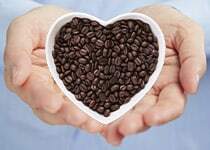 It will give you a general outline of how to install, but the details are lacking. Especially if you have a non-standard ceiling height, you might run into some installation problems. This island range hood is beautiful. The curved glass is a nice touch for the already modern stainless steel look. 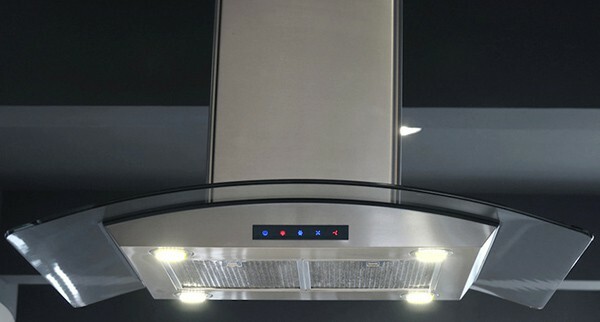 If you want an attention grabber in your kitchen, you should definitely get this range hood. 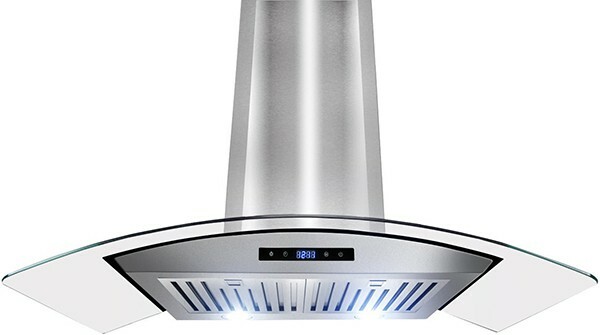 Combine it with a great price and you have yourself a great looking range hood which won’t break the bank. 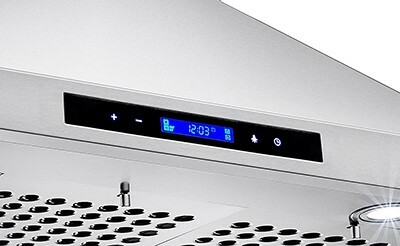 It's great that Firebird decided to equip the range hood with LED lighting, however, they don't seem to be that bright. Therefore we wouldn't recommend the range hood to be the primary source of lighting in your kitchen. 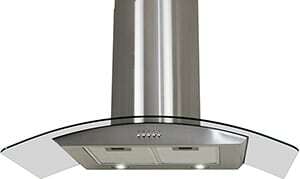 It's a very stylish chimney island mount range hood with a great price/quality ratio which does what it has to do. 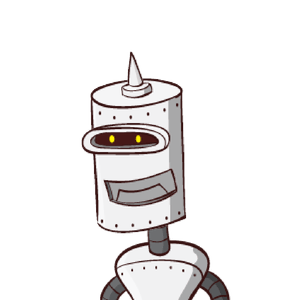 ​​We find it incredibly refreshing to see a company like ExtremeAIR have faith in their product to an extent that they are willing to provide customers with a 10 year warranty on their motor. Obviously, all this quality comes at a price. A monetary price. Even though the range hood isn’t as expensive as some other high end chimney island range hoods, it might still put a dent in your budget.